Liberal MP and Parliamentary Secretary Jennifer O’Connell with Prime Minister Justin Trudeau (Photo: joconnell.liberal.ca). Just when you thought it was about to fade away over the coming weekend, the saga of Jason Kenney’s dubious House of Commons housing expense claims got a new lease on life yesterday thanks to a Liberal Member of Parliament from Ontario. United Conservative Party Leader Jason Kenney wearing an expression we may be seeing a lot on his face (Photo: CBC). Ms.O’Connell is not just any MP. She is Parliamentary Secretary to Finance Minister Bill Morneau with responsibility for Youth Economic Opportunities. In other words, she’s closer to the inner circle than most MPs, and she’s been spotted as someone with political talent who has at least the potential for a cabinet post someday. What’s more, her office ensured copies of her short letter to the Speaker of the House of Commons asking for the investigation by the Board of Internal Economy, the committee that oversees expenditures by MPs, found its way into the hands of the members of the Parliamentary Press Gallery. This is more, in my estimation, than a warning. It may not quite be open war, but it’s certainly a message to Alberta’s United Conservative Party that the government of Prime Minister Justin Trudeau is going to play hardball with them, even if the Alberta NDP won’t. It’s notice that that the Trudeau Government has had enough of Mr. Kenney’s relentless false claims that it is doing nothing to help Alberta build a pipeline to the West Coast and his frequent dark hints Mr. Trudeau is even trying to sabotage it, when they are spending literally billions of dollars and loads of political capital to achieve the opposite result. Despite the fact he’s now a provincial Opposition leader running for Alberta’s top political job, Mr. Kenney has also not made much effort to hide the fact he views Mr. Trudeau, not Alberta Premier Rachel Notley, as his principal political rival, and that he covets the PM’s job in Ottawa. Then there’s that notorious and unintentionally hilarious Maclean’s Magazine cover in which Mr. Kenney identified himself with a group of Conservative premiers who are actively trying to use their provincial positions to manoeuvre the federal Conservatives into power – a strategy from the U.S. Republican playbook hitherto not that common in Canada. So Ms. O’Connell’s move yesterday was tactical – her letter to Speaker Geoff Regan will keep the pot boiling under Mr. Kenney at a time he and his local media echo chamber are trying desperately to divert attention away from this issue. That may or may not help the Alberta NDP led by Rachel Notley, but it’s unlikely to hurt them. However, that’s probably not the primary objective. It’s also strategic – intended to ensure Mr. Kenney never realizes his dream of returning to Ottawa in triumph. Or, for that matter, that any other Conservative manages the same feat as long as Mr. Trudeau is around. So the first thing Ms. O’Connell’s letter is intended to do, it is said here, is to deliver a sharp lesson to Mr. Kenney that he is not the only Canadian politician who knows how to play hardball. The Alberta NDP may have decided to be nice guys, and therefore risk finishing last while keeping their honour intact. But take note, the Trudeau Liberals are made of sterner stuff and if Mr. Kenney slams them, he’s going to get slammed back. Starting now. The second thing it is surely intended to do is to neutralize Mr. Kenney as a threat to Mr. Trudeau and the Liberals in the mid-term, after they’ve finished with the hapless Andrew Scheer, the foundering leader of the federal Conservative Party. This may not work well for the Liberals in Alberta. They may even lose some or all of their four Alberta seats in the federal election expected next fall. But they will likely reap dividends elsewhere in Canada, where Mr. Kenney’s noisy rejection of the idea of social licence for pipelines and sotto voce encouragement of the most extreme elements in his own party will not get him as much traction. “The second residence allowance exists so that Members of Parliament can both fulfill their Parliamentary responsibilities as legislators in the House of Commons and remain present in their constituencies to help and support the Canadians they represent,” Ms. O’Connell stated in her letter to Mr. Regan. “However, it is important that this allowance be used fairly and properly. “I urge the Board of Internal Economy, with support from the House of Commons administration, to investigate this matter, make appropriate recommendations, or seek appropriate penalties and reimbursements from Mr. Kenney, should the Board find that he contravened the rules,” she concluded. Mr. Kenney, naturally, stuck to his frequent talking point claim the federal Liberals and Alberta New Democrats are allies and that the allegations about his conduct are “sleazy, baseless accusations.” His supporters among Postmedia’s political columnists can be expected to join that barking chain today. But whether he likes it or not, this story now has legs. Mr. Kenney may have some ’splainin’ to do after all, and, if he does, developments are unlikely to be timed to suit his campaign schedule. Justin Trudeau knows if Jason Kenney is elected it is going to make his re-election on a pro carbon tax platform that much more difficult. To me after 3 years of Justin Trudeau it is very obvious he doesn’t give a damn about taxpayers money and to pretend now that he does is laughable. This is all politics. Regardless of your political ideology Jason Kenney was one of the hardest working MP’s in Ottawa and being a higher profile MP was always on the road. This just shows me that even Justin Trudeau is afraid of Jason Kenney. Off topic question, can someone explain the logic of Jagmeet Singh’s position on Venezuala? Get real! Jason Kenny never worked at a real job in his life. All he knows is how to bloviate and play political games. The last thing that comes to mind when I think of him is “hard working”. Farmer Brian can you tell me what Jason Kenney accomplished for Alberta or Canada while sitting as an MP in Ottawa. It certainly wasn’t any pipelines getting built. 1. Kinder Morgan’s anchor loop pipeline: 160 kilometre expansion project through BC and Alberta Rocky Mountain’s increased the flow of the Trans Mountain pipeline by 15%. 2. TransCanada’s Keystone pipeline( not keystone XL): Huge project connecting Alberta to Texas, construction began in January 2012 and was completed in 2017. 3. Enbridge’s Alberta Clipper pipeline: A 1600 kilometre pipeline from Alberta to Wisconsin was constructed in 2010. 4. Enbridge’s Line 9 reversal from near Hamilton Ontario to Montreal. Northern Gateway was approved under Stephen Harper but was overturned in court when Justin Trudeau was Prime Minister. Justin Trudeau finally killed it with Premier Notley’s approval on Nov. 30, 2016, the same day he approved the Trans Mountain expansion and Enbridge’s line 3. Trans Mountain has yet to see a shovel in the ground. Then there is Keystone XL which was approved by Stephen Harper, held up by President Obama, approved by President Trump with construction projected to begin this year. The Trans Mountain expansion began the approval process under Stephen Harper but that process is yet to be completed under Justin Trudeau. FB: You do understand that the Judicial system operates separately and independently of elected Politicians? That means pipeline companies have to obey the law. When they cannot meet that test, there is really nothing politicians can do – unless they want to go down the same fascist path the Apartheid government of South Africa followed. That government consistently re-wrote laws to nullify human rights based court judgements against their policy. How do you feel about having your personal and property rights taken away from you to support the latest pet project of some political party? Farmer Brian, none of those pipelines you mention made it to tidewater thanks for the so called hard working Jason Kenney. Eastern Canada is still buying oil from the middle east. I had two Enbridge pipelines cross my property during that time none needed approval from the Federal Government. Is there anything Jason Kenney accomplished for Alberta or Canada during his 10 year term with the Federal Government? Except for taking Paul Martin’s balanced budget back to deficit. I’ll volunteer to explain the logic of the NDP’s position on Venezuela. It’s a sovereign country that has the right to govern itself, indeed make its own mistakes, without US interference. The US has a sordid history in Latin America, and the latest steps seem to continue that pattern. Canada has long taken the independent position of dealing with the de facto government in other countries (Cuba, China) instead of following the US ideological lead. Ottawa’s hasty declaration should be reconsidered. And yes, the people of Venezuela are suffering, but so are the people of Puerto Rico. Should we be pursuing regime change there? Regarding your last question about Venezuela: The U.S. legacy in South and central America is to make bad situations 10 times worse. That and the fact that the guy Trump has tapped to oversee the Venezuela file oversaw Guatemalan death squads for the Bush 1 administration. It’s no wonder the fawning scribes at Postmedia, who carry water for the UCP, wished this Kenney dumpster fire would extinguish itself — it’s hard to win when you’re always losing political ground. With charges of a “Kamikaze” leadership campaign, improper nomination meetings, an ugly UCP rebellion against a top-down leadership style, suspicious dark money donations, cozy relationships with car dealers to spike the UCP election war chest, intemperate rhetoric by candidate nominees and members, ballot box stuffing and this newly uncovered bit of political chicanery surround a housing allowance, it’s really nice to see Jason Kenney’s scandal-plagued Alberta political career is off to such a good start — scandal-wise. What’s not to like? Mr. Kenney says he is “compliant with the rules”. That’s only because the rules are a joke that allow grifters to fill their pockets. Who was doing the dragging? In whose assisted living basement was Jason hanging out? The mayor’s? It seems right to me that the Feds should take the lead on this, after all it was Federal money and the issue here is whether Mr. Kenney fictitiously claimed to live in his moms seniors complex in order to get a housing allowance while an MP. If there is a role for the provincial government here it is mostly to watch as Mr. Kenney gets hoisted on his own petard. I suppose there are also some provincial matters at issue here too, such as that troubling donation Mr. Kenney made in Ontario (maybe one day he forgot what province he was “supposed” to live in) and maintaining an Alberta drivers license despite only being in Alberta for 4 days in 2015. In any event, I suspect the Federal Liberals will do Mr. Kenney no favours in the timing of dealing with this matter and even as much as Mr. Kenney’s local media friends want to quickly sweep the whole thing under the carpet, the non Alberta national media will probably be glad to jump in and give this matter coverage. It probably wouldn’t be first time the Globe and Mail or Star might lead coverage of the misdeeds of an Alberta conservative politician that the local post media seems to initially miss or ignore. Of course, Kenney will try to spin it as the Federal Liberals being out to get him and encourage his friends in the local post media to echo that. The more fervent supporters of him and the UCP will go with that too, but I suspect those that are less committed or more independent minded will be concerned by these troubling allegations. One other related problem for Mr. Kenney is that he plays politics a bit rough and so has made some enemies both in other parties and among Conservatives. If this housing allowance issue does cause him to falter, he could find the ride on the way down to be unexpectedly swift and bumpy. Are the American influenced newspapers under Post media control, which support Jason Kenney, still controlled by American hedge funds? Not to long ago some of these Americans from the US hedge funds were on the Board of Postmedia. As Jason Kenney is a red white and blue poster boy for American influence, it is not surprising that Postmedia is propping him up like a puppet in their newspapers, like the Calgary Herald or the Sun. It has been reported that Kenney had an illegal basement suite in his mother’s retirement unit, which was potentially subsidized by Canadian tax payers in part. The illegal suite apparently was not allowed by the retirement facility. 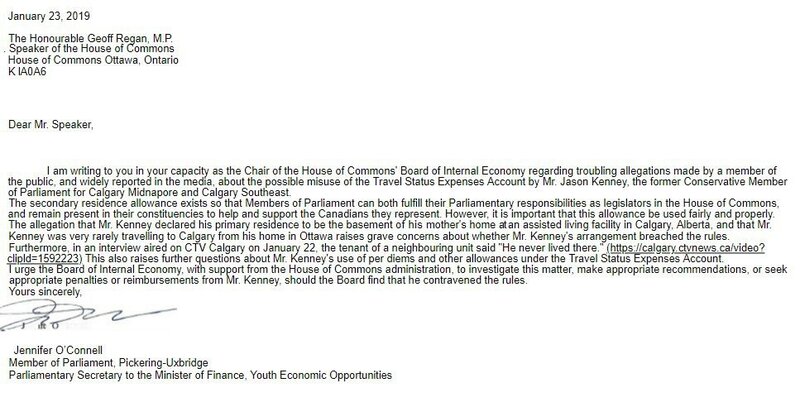 I guess Kenney does not care much about rules and fairness though when he sees and opportunity to benefit. It begs the question, was Jason Kenney basically subsidizing his mother’s pad at the expense of Canadians? Alberta MLA Derek Fildebrandt got busted for renting out his tax payer subsidized unit in an Air B&B scam. I don’t see much difference between Derek Fildebrandt and Jason Kenney. They both took advantage of the Alberta tax payers. I guess that is why they call it the Alberta Advantage. If that retirement housing facility was smart, they would fine Jason Kenney for his illegal suite and use the proceeds to upgrade the facilities. Thank you, David, for my weekend Schadenfreude.